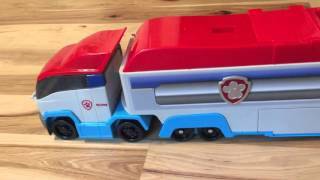 The Paw Patroller is a great big Paw Patrol truck that can hold lots of Paw Patrol figures and vehicles, and opens up to become a playset on wheels. Our kids enjoy playing with it, particularly using the elevator to catapult Paw Patrol figures into the air. No assembly required, and it has some nice design touches, like a special accommodation for Zuma's hovercraft.